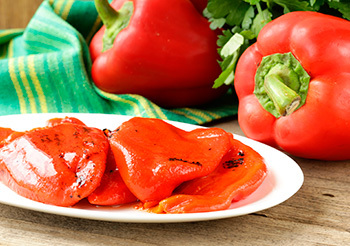 I love to roast vegetables, especially red peppers. They take a bit of time to make, but having roast peppers on hand for a quinoa like this or for sandwiches is worth the effort. This recipe makes great leftovers. Serve hot or cold. Place the pepper in the oven on a piece of aluminum foil. Roast for 20-25 minutes, turning occasionally so that the pepper browns on all sides. After the peppers have been roasting for about 10 minutes, spray another pan with olive oil and add the green onions. Place the skillet in the oven. After 25 minutes, remove the pepper and place in a small paper bag, with the top folded closed, to cool. Remove the green onions from the oven and place on a plate to cool. When the pepper is cool, peel and seed the pepper and discard both the burned outer peel, the stem, and the seeds. Cut into large dice and set aside. When the green onions are cool, slice into 1/4 inch sections. Place the water, salt, and tarragon in a small saucepan over high heat. When the water boils, add the quinoa, stir, and reduce the heat to simmer. When the quinoa is cooked, add the diced peppers, the green onions, capers, and butter. Stir until the butter is melted, then serve.